High Definition videos from the WPRA of the 2013 WNFR Round Winners. Enjoy watching all 10 rounds of the 2013 Wrangler National Finals Rodeo. Taylor Jacob sets a new arena record and Sherry Cervi sets an average time record while winning the World Championship. Looking for Barrel Racing Drills and Exercises? 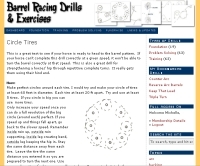 Check out our sister site www.BarrelRacingDrills.com and get your access pass to improve your times today! CBHI Superstakes mare for sale! True 1/2D, youth approved gelding!